If you are considering studying abroad, I would definitely recommend Edinburgh, Scotland. I knew it would be nice being in Scotland, but I did not expect to fall in love with the city like I have. Everywhere you turn, there is a view so beautiful it seems like it could be a post card. The buildings are so old and different from anything I have seen in the US, I like to just look at them sometimes. The city is made up of the Old Town and the New Town. The Old Town has the castle, the University, and many really awesome old buildings. Even though the New Town is newer, the buildings are still about 200 years old. Edinburgh is full of many different things to do. The castle is probably the main tourist attraction. It is at the top of a hill that is actually an old volcano. It has been destroyed throughout the years, but the oldest standing building (Saint Margaret’s Chapel) is from the 1100s. The castle has Royal Apartments, where royals like Mary Queen of Scots lived. 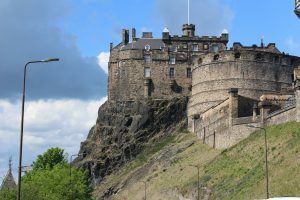 Since it is one of the highest points in the city, you can get some amazing views of Edinburgh from the castle. 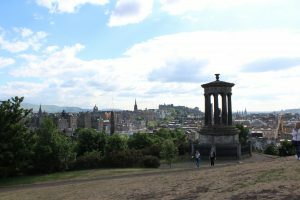 My personal favorite thing to do in Edinburgh is to walk up Calton Hill. It is a hill with a few buildings and structures at the top. It has an old observatory and the Nelson monument which is a tower you can climb up into. It also has an acropolis, which was built in the 1800s and intended to be a recreation of the Parthenon. However, only the façade was built because they ran out of money for construction. It is very cool to look at, and you can climb onto it for a nice photo. 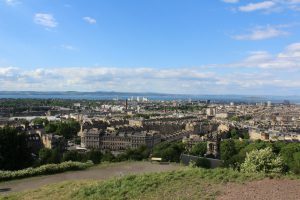 I love Calton Hill so much because the panoramic views are so beautiful. It is also very easily accessible. You just walk up some stairs and you are at the top. It is somewhere I like to go for a walk. 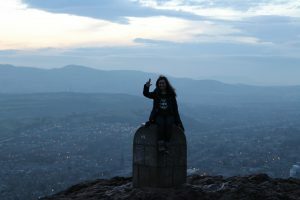 There are always some people at Calton Hill, but it is never packed or too crowded. There are usually just a handful of people around. One side of the hill looks out over Princes Street, one of the main roads and shopping areas of Edinburgh. You can get a beautiful view of the castle and the Old Town. Another part of Calton Hill overlooks Holyrood Palace, the Queen’s official residence when she comes to Scotland. You can tour the Palace when there are no royals visiting. There are also great views of Arthur’s Seat from the top of Calton Hill. The other side of the hill looks over the town of Leith. This town is really nice and has a river called the Waters of Leith running through it. Arthur’s Seat is a mountain that is on an old volcano. You can walk to the top in about 30 minutes. There are several different paths you can take to get to the top, with varying difficulty. It is very popular because of its great panoramic views. It is right next to Holyrood Place and Holyrood Park. This park is pretty large. It is one of the places I like to go for a walk or run. Another great attraction is the National Museum of Scotland. It really has something for everyone. It has a huge section for Scottish history, world cultures, animals, art and fashion, as well as space and technology. There is a huge room filled with stuffed animals and skeletons. It is really cool to see how big some animals actually are. 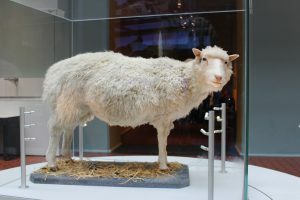 In the science and technology section, they have Dolly the Sheep on display. She was the first mammal to be cloned from an adult cell. She was actually cloned by the University of Edinburgh. I have been to this museum several times, but still have not seen everything. It is free to get in, which is always nice. It is a really pretty building on the inside, and has so many different things in it that it is almost overwhelming. If you have enough time, I think it is good to go for a couple hours and then come back another day so that you can really be focused and get the most out of everything that is there. Edinburgh is a wonderful city that is full of great things to do. 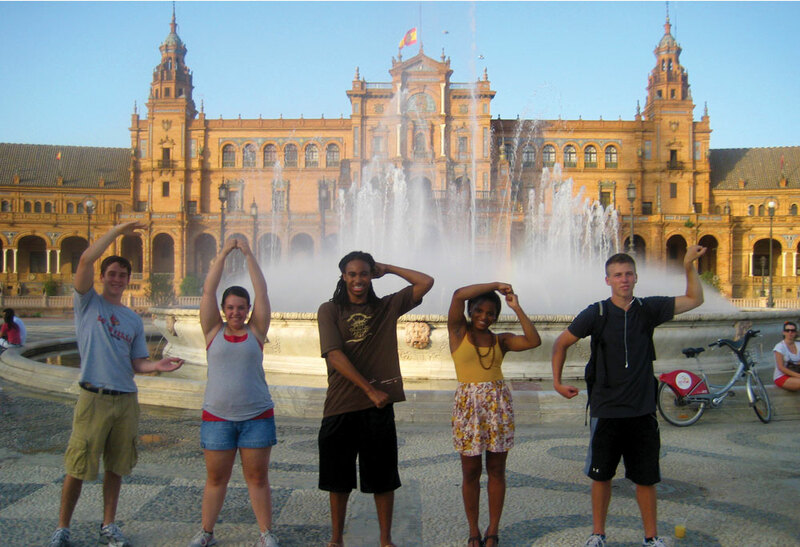 It is extremely beautiful and filled with friendly and welcoming people. If you have the opportunity to go to Edinburgh, I would definitely recommend it! This entry was posted in Uncategorized by aknash02. Bookmark the permalink.